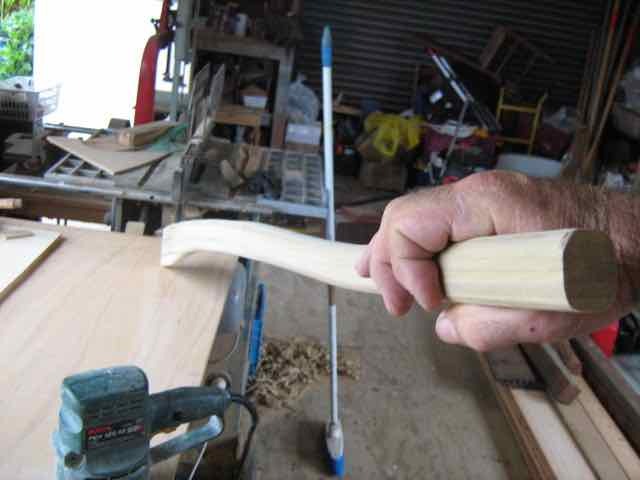 Laminating a curved item such as a tiller is one of the more rewarding jobs. A gracefully curved and very strong tiller with the gluelines accentuating the curves can add a nice touch to the boat, and its not hard to do. Heres "me" making a tiller for SEI. Now SEI being a double ender has the rudder a little further away from the skippers hand than is usual in a transom sterned boat so needs a longer tiller than would otherwise be the case. That’s consideration number one, consideration number two was the shape, then consideration number three was what to make it from. I didn’t have a suitable piece wide enough to cut the shape from in one piece, and friend Bill Simpson had given me an interesting piece of wood that had come from a big shipping pallet. Who knows what it is, but its light, tough, is close grained and glued well. 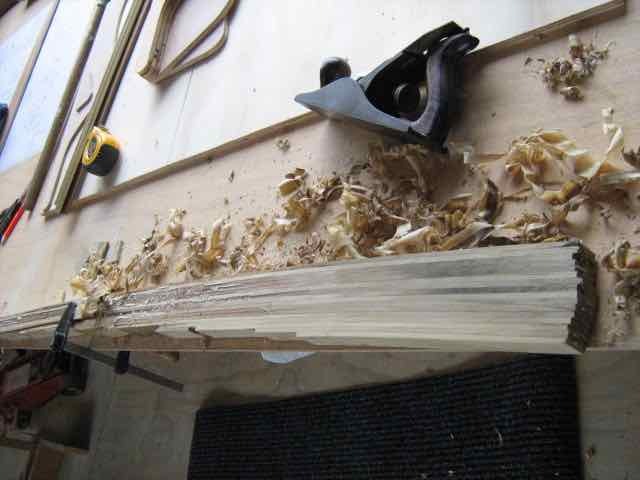 It is not so easy to work with a hand plane, the fibers being long and tough don’t cut so well, but wood like that generally machines well, so I figured that being much too narrow, I’d laminate the tiller. 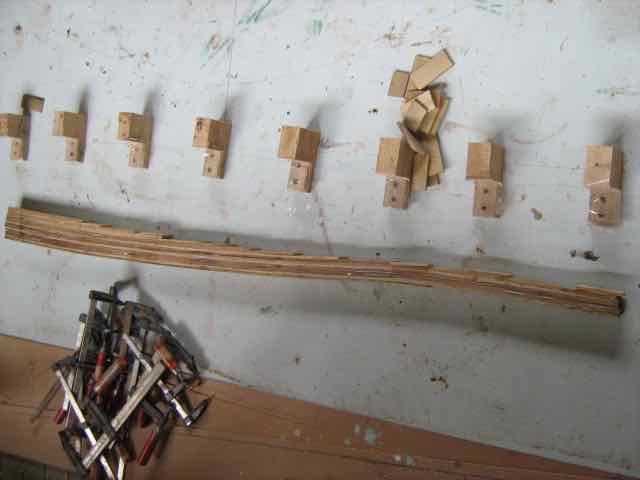 The tiller slot in the rudder stock ( rudder head in some languages ) being 27 mm wide I sliced up the wood with the sawbench, cutting first to make two 35 mm pieces out of the 70plus wide piece to give me room to plane it down to the 27mm width, then splitting that into 5mm lamells. I took a piece of scrap ply down to the boat, propped it in place and drew the shape of the tiller thereon. Reproduced that on the plywood floor in the boatshed, screwed the laminating clamp blocks into place and mixed up some glue. There is not a lot of curve in this tiller, I like the “hand end” to be about 100mm above the knee when sitting at the helm, and the final position will be set by shaping the haft end where it sits in the tapered slot in the rudder stock. So with only a gentle curve to accommodate this was an easy job to lay up and clamp. 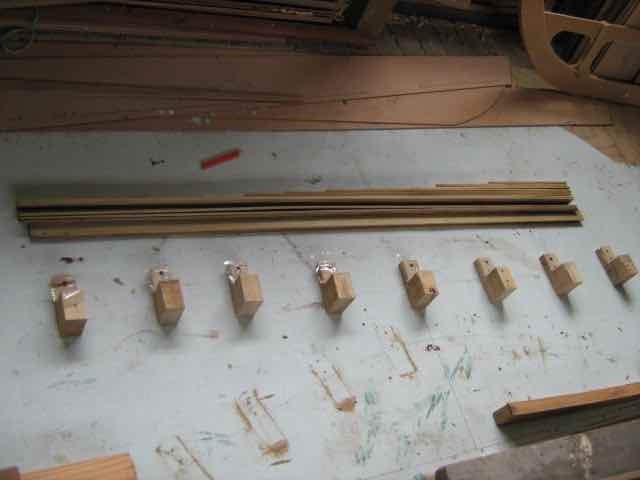 The shape drawn on the plywood boatshed floor, and the clamping blocks screwed in place, the lamells are laid out in order. Note that the tiller is much deeper at one end and finer at the handle end, so there are more layers at the "thick" end, no need to have it the same depth all the way. I'm read to start applying glue. Glue applied, priming the one and laying the glue on the other for each layer, the whole set was layed on the supports, then clamps with little pads under the clamps feet were fitted, just lightly, then gradually tightened to bring the 12 lamells into the curve. 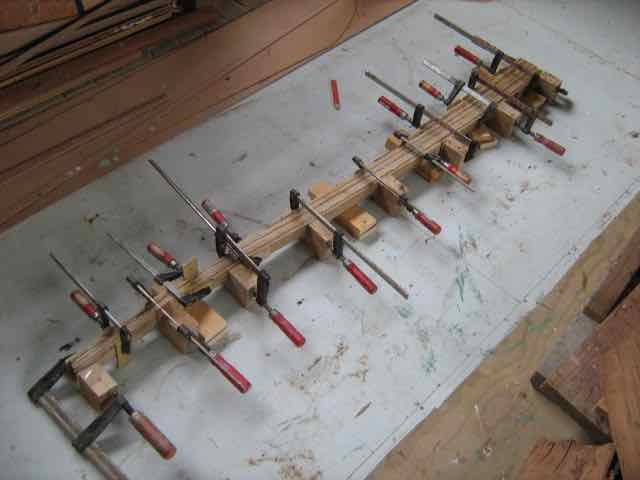 Easy peasy, a little at a time but with that many layers in there the amount of force applied between the many clamps is considerable, so it pays to just be patient, a little at a time works well. All glued, and clamped up. Its time to go and do something else for a day or so. Next day with the glue all set, the first job was to plane it to the correct thickness, so it was with a scrub plane, that’s an ordinary block plane, in this case a Stanley number 4, with the blade sharpened with a round in the edge so the corners don’t dig in, that I cut all the glue squeeze out away and scrubbed that side down to fairly flat. The edges of the layup don’t match perfectly so there is a bit of material to remove, that’s why the lamells are 35 mm for a finished thickness of 27 mm. All good, now its time to get all the bumps off and the blank planed down to the correct thickness. With one side fairly flat and the bumps of glue removed I put the blank through the planer, flat side down and the other side getting planed down. Three passes got it down straight and true, then flipped it over and trued up the side I’d hand planed. In action with the scrub plane. Note that I have a heap of these Stanley number 4s, 9 I think, and several have their blades ground for particular purposes such as this. I watch the shelves down the back of a couple of favourite junkshops and if I see one at under $20 I'll buy it, do a little work on it it if needed, and put it on the shelf with its brothers and sisters. You'd be surprised at how often I use more than one on a job. Careful measureing, still well over the 27 mm I needed, so more passes through the planer, taking care to remove a few little defects on the way, and when it was close, I tried the fit in the tiller slot, a couple of very fine cuts in the planer and I was happy with that. Either of these would do fine as long as attention was paid to keeping it perpendicular to the surface being cut through. Action with the router, that edge near the power tool is now nicely rounded over, it took about 30 seconds. Note that I was given that old beast of a router by my elderly uncle, he thinks its probably 40 years old, today you'd get one like that for $10 or so and it works just fine. Its much simpler than todays flash harry ones, and I much prefer it for heavier use. I've a little laminate trimmer for very light work but this is the workhorse when there is serious stuff to do. With the shape cut, the edges were trued up with a random orbit sander, the piece clamped to the edge of the bench then a router with a 12mm radius bit employed to round the edges. Remember not to round the haft where it fits into the tiller slot, that just needs a very small round with sandpaper. With some light sanding, its done. Looks sweet, looks much harder to make than it really is. Just a few finishing touches to be added. I cant wait to use it for real. I’ll varnish it, apart from the oarlock support blocks it’s the only varnish on the boat, it adds a nice finishing touch. I’m not so far away from sailing SEI, have to finish the rudder assembly, turn some wooden end blocks for the carbon fiber boom and yard, then rig it, and I’ll be at the mercy of the winds. Another new launching, this one is the 6 Metre Whaler. I orginally drew this design for use as a sort of “Outward Bound” education center boat, one that would carry 6 trainees and an instructor, all their gear for overnight camping and provide a “job” for each while sailing, and still be workable single handed. The boat had to be less than 6 Metres long in order to avoid the expensive government surveys required of larger boats that are used to carry paying passengers. That plus a nod to Naval tradition, made for the yawl rigged, lapstrake planked 6m ( actually just a tiny fraction under , just to make sure) centerboarder that I dubbed the 6 Metre Whaler. Its not a whaler, not really, but is much more closely related to the Swedish Spitzgatter shape being fine forward and full aft. This is a good sailing shape, fast, with strong resistance to both pitch and roll, stable and easy to manage. Over the years the design has sold steadily, she’s proven to be a very good family boat, a cruiser, and although the gent who’s brief kicked the design off did not get his training program off the ground there are several Naval Cadet or Sea Scout groups using them as they were intended. Mark Barrowsmith in New Zealands North sent me these three pics of his build, I’d just had a comment from a friend who lives close to the boat ramp in Opua in the Bay of Islands, he mentioned that he’d seen a nice example of the design being launched, and voila! Pics arrive from the builder/owner. I’m planning to drive up his way in a couple of weeks time, and hope to call to meet him and check the boat out. There is no better way for a designer to spend an hour or so than leaning on the gunwale of a new boat chatting to a happy owner. Thanks Mark, see you soon. By the way, Boatbuilder Peter Murton has one for sale. Its a very nice example, of course its professionally built so the standard of the structure is tops. he's at the north end of the South Island, if anyone is interested I can pass the enquiry on. The interior looking forward, lots of space, lots of storage and lots of bouyancy. The interior looking aft, the engine lives in a well under the cover you can see under the tiller. Its accessible and easy to operate there, no hanging over the transom. In fact, no transom! On her trailer, looking from forward, I like the colour scheme. Nice work. Side view. Note that Mark has fitted the mainmast into a tabernacle to make it easier to stand up, and has taken the tiller over the top of the after deck to get a little more swing. I cant wait to see some pics of her out sailing. Nice job, well done. Old tools, but good ones. I’m not really a tool freak, not a collector in the sense of lovingly restoring old woodworking hand tools and putting them on display in glass fronted shelving but I do enjoy getting my hands on old tools and bringing them back to life. When I’ve a particular little job that needs a special tool, and I can go to my shelf and pick up a tool that was designed to do that special thing, I get great satisfaction from using it. So I watch out for the unusual as well as the standard ones that I use every day. Junkshops, garage sales, on line auctions and occasionally a friends eagle eye all bring in treasures. My usuals the ones that I’ll buy without thinking are the Record and Stanley number 3 or number 4 planes. Those are tools that I use every time I go into the boatshed, and now, living on the ship with the boatshed here plus my old shop back in Hamilton still being used, I have built up a double set of tools. I’ve now 10 of those, the reason being that when working and one wears its sharp edge off or I hit something that puts a nick in the blade, that plane goes in the shelf above and I pick up another that’s sharp and set. To be sure, when they’re all in need of a sharpen it’s a big job, but on a wet morning when there is no one around its quite a satisfying thing to set up an assembly line with the dry grinder, the wet grinder, the two different grade waterstones and the lap, and run through them all. Just recently my friend Paul Mullins came across a couple of unusual tools when a neighbours shed was being cleaned out. There was a Stanley number 67 Spokeshave, this one is designed to cut right up against an edge and could be used to tidy up a curved rebate, left or right handed. The number 67 spokeshave, note how the handles can be repositioned to allow it to work against a rebate, that can be done either side. Interesting tool. The other is a router. No, not one of those noisy finger biting things a “real” one. Used to be known as a “Grannys tooth”. 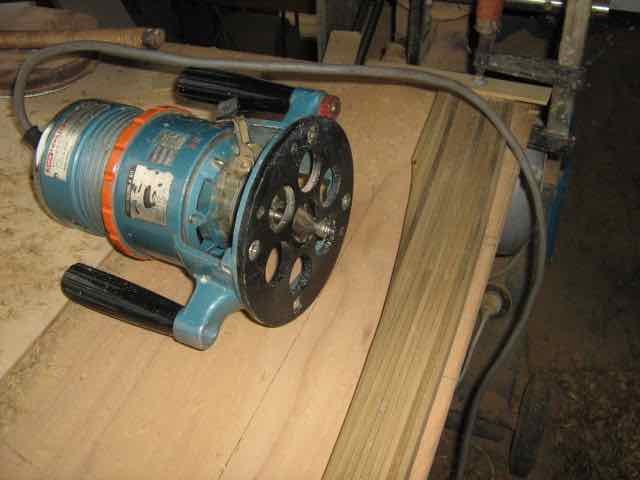 Its a Stanley number 71 1/2, one of a series of different sized routers that Stanley made. It’s a hand tool, essentially a flat plate with a pair of handles and a cutter that extends below the plate, push it and it cuts away below the surface, the cutter can be set for depth so its able to gradually work away increasing the depth of the cut. Stanley number 71 1/2 router with 1/2 in and 3/8in cutters. I do use one of these now and again, have also the very small one which I use when carving tabletops and such. Note that these, like almost all Stanley tools found in New Zealand or Australia are English Stanley so there are some differences from those made in the USA. I was thinking that I should be looking for a brass wire brush to start tidying these two treasures up, they’ve been soaking in Inox for a while now, and are ready or a cleanup before I regrind the cutting edges and flat the backs of the irons, when my very elderly uncle, a joiner by trade, gave me a Stanley number 55 combination moulding plane that he’d had since very early in his career. Its got all the standard irons, no parts missing, it’s a real treat! Heres the link to a page of pics. These planes can be used to make mouldings. Look around your house at picture frames, the surrounds of windows and doors, skirting boards ceiling coves, cupboards and chests and you’ll see a huge variety of different shapes. This plane can make all of those. Not in one pass you understand, but by planing away part of the profile then changing the blade and the positioning of it, it then does another part of the shape. In its original box, this ones done quite a lot of work but all of the original parts including "the book" are there and in good order. There are a lot of parts to one of these, the handle is out to the left and each of the parts to the right is a separate fence and depth gauge system, some of which have knife holders as well as scribers. I should have counted them, there are probably 40 different knives in the set, rounded, radius edge, beading, rebate, oogee, you name it. Amazing tool. Yes I've used one, but its not something that I'd use every day. This is a collectors item, will be greased up and stored, but maybe, just maybe, I'll need it to produce a moulding to match something existing someday. They're slow, but if one is matching up a section no longer available off the shelf, or too big for a router bit (the electric finger biting kind not the one above) it’s a practical and useful tool. That plus it’s a really impressive thing to show off with.